A country that seamlessly blends the ancient and traditional with everything hyper-modern, Japan has emerged as one of the world’s must-see destinations. Well known for its beautiful scenery and rich culture, the country offers visitors a wide variety of things to see, do and discover. If you’re thinking of visiting this wonderful part of the world, check out our top 10 incredible things to do in Japan. 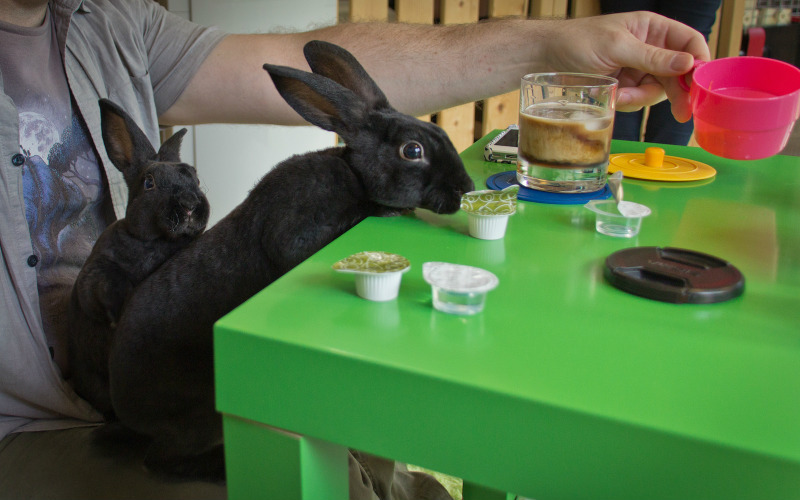 Well known as a country that embraces the weird and wonderful, it really comes as no surprise that animal cafes (eateries featuring all manner of cute and cuddly critters) have become increasingly popular in Japan in recent years. Originally developed to allow locals to enjoy some time with animals that they otherwise wouldn’t be able to keep in their small city apartments, the cafes have become internationally renowned for their unique concept and fascinating assortment of resident creatures. In Tokyo alone, you’ll find cat cafes, rabbit cafes, dog cafes, owl cafes and, unbelievably, even snake cafes, meaning that whatever your animal preferences may be, you’re sure to find one that will leave you with a smile. Bunny cafe in Harajuku, Tokyo, Japan. Image Credit: John Gillespie / CC by SA 2.0. Perhaps best known in the western world as the ‘bullet train’, Japan’s Shinkansen is an incredible high speed railway network that links the country’s major cities and regional centres. Running from Hakodate in the north to Kagoshima in the south, the network makes it easy to see more of the country, with services travelling at remarkable speeds of up to 320 km/h. 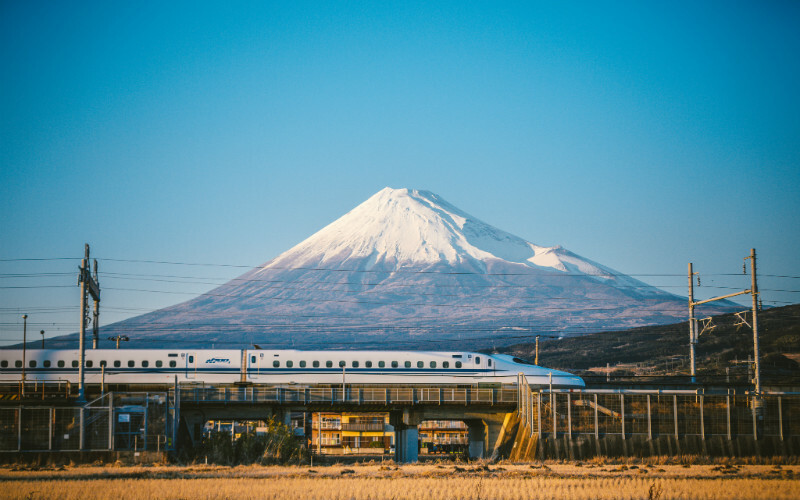 Safe, efficient and quite comfortable, the Shinkansen is not only a great way to get around, but also a must-do activity for every first time visitor to Japan. Shinkansen in front of Mount Fuji, Japan. Image Credit: hans-johnson / CC by ND 2.0. 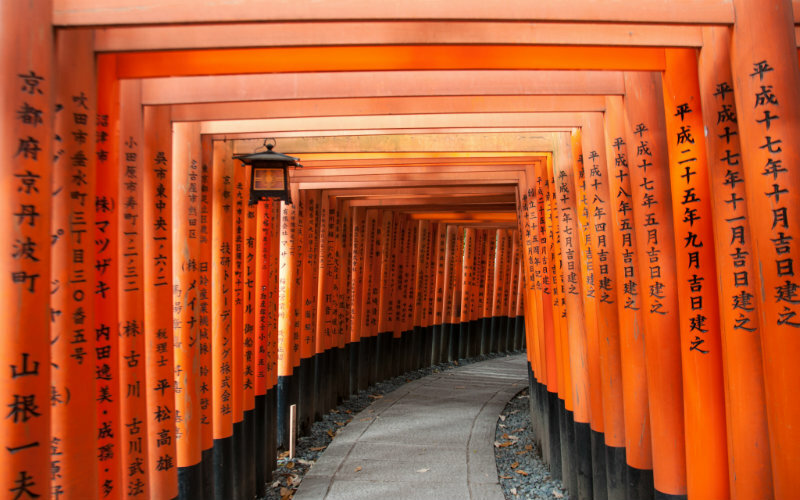 Located just beyond central Kyoto, Fushimi Inari Shrine, a shrine dedicated to the god of rice and sake, is a religious site that is best known for the thousands of bright red torii gates that line its pathways. With the shrine’s earliest structures dating as far back as the early 8th century, the site is not only rich with history but is also among the country’s most visited shrines. Great for a day out or even a briefer visit if you don’t happen to have the luxury of time, the stunning mountain setting of the shrine makes it a beautiful place to explore. Fushimi Inari Shrine, Japan. Image Credit: chee.hong / CC by 2.0. 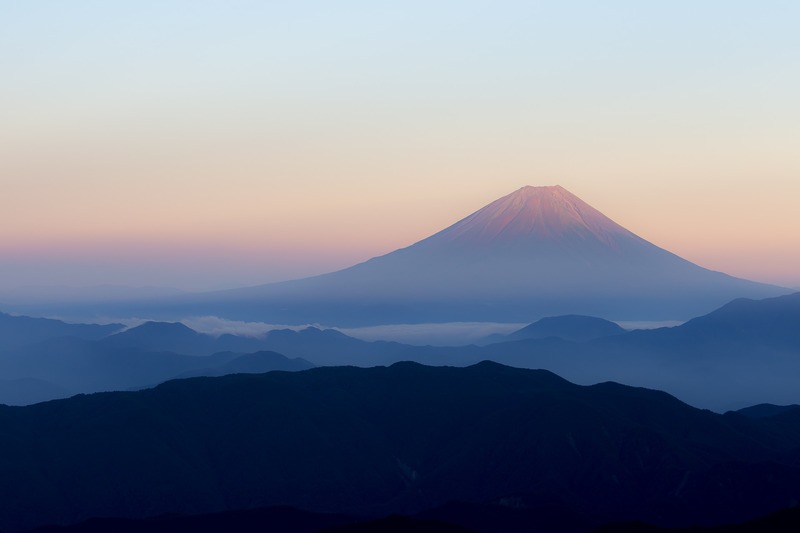 Standing at a towering 3,776 metres, Mount Fuji is easily one of Japan’s most iconic and easily recognisable sights. World Heritage listed in 2013 and long associated with traditional beliefs and legends, it is an incredible sight to behold. 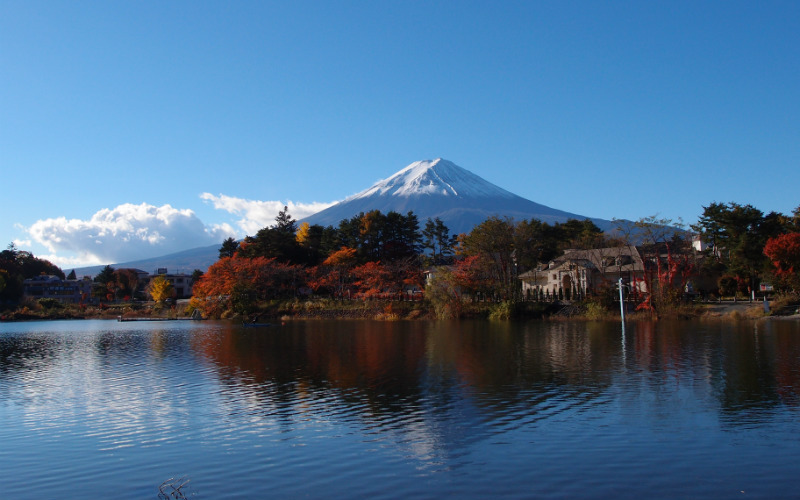 There are a number of great spots to see the mountain in all its glory, with the shores of Lake Kawaguchiko, the resort town of Hakone and the village of Oshino Hakkai offering some of the best views. If you’d prefer to see the mountain up close, or even climb to its summit, the official climbing season spans from early July to mid September, when the mountain is typically free of snow and conditions are more favourable. Mount Fuji from Lake Kawaguchiko, Japan. Image Credit: Guilhem Vellut / CC by 2.0. Perhaps best known for its resident deer population, Nara Park is a beautiful public park situated in Southern Japan. 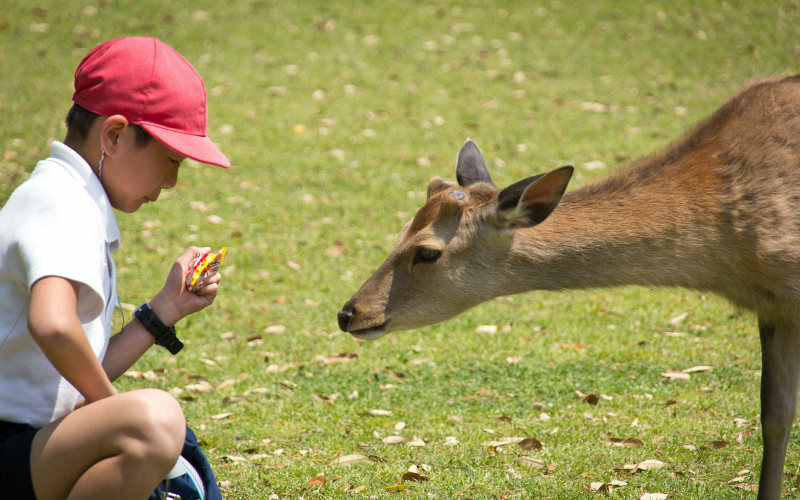 Covering an expansive 660 hectares, a stroll through the park and its landscaped grounds allows visitors to encounter some of the hundreds of free roaming deer that call the park home. Once considered to be messengers of the Shinto gods, the park’s four-legged residents are quite tame, with some even having learnt to bow to visitors for a serving of the special deer crackers sold within the park. Nara Park, Japan. Image Credit: John Gillespie / CC by SA 2.0. 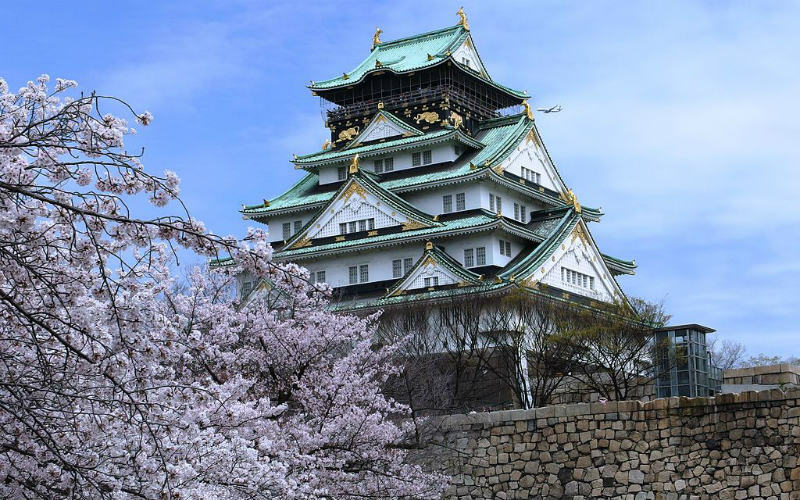 Originally constructed during the 16th century, Osaka Castle is an intriguing structure with a fascinating history. Built under the guidance of Toyotomi Hideyoshi, the ‘great unifier’ of Japan, the castle has been burnt to the ground, struck by lightning, conquered and damaged by bombing raids during its lifetime, but has been lovingly rebuilt and restored time after time. The castle’s current incarnation, constructed in 1931 and restored during the 1990s, and its grounds are open to visitors looking to admire the beauty and rich heritage of the site. Home to a number of cherry blossoms, the castle grounds also burst to life with beautiful pastel blooms each spring. Osaka Castle, Osaka, Japan. Image Credit: Mc681 / CC by SA 4.0. Situated in what was once the vibrant heart of Hiroshima, the site on which the Hiroshima Peace Memorial Park and Museum stand now serves as means to commemorate both the lives lost and those that were forever changed by the dropping of an atomic bomb on the city in mid-1945. A sobering reminder of the scale and human impact of the attack, the park and museum were created to honour those who perished, share the stories of those who survived the bombing and to remind visitors of the precious nature of peace. 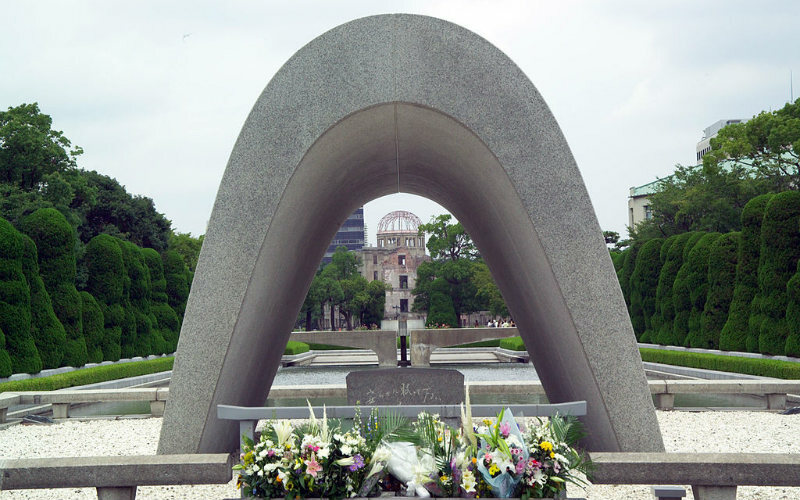 A number of monuments are scattered throughout the park, with the A-Bomb Dome, the skeleton of a building that was located close to bomb’s hypocentre, helping to put the true scale and impact of the event into perspective. Hiroshima Peace Memorial Park, Hiroshima, Japan. There are few experiences that are quite as iconically Japanese as a visit to an onsen, a public hot spring bathhouse. Although a first time visit may be a little confronting and uncomfortable (visitors are often expected to bathe with no clothing at all), following traditional etiquette helps to avoid any awkward moments. Each establishment may have slightly different rules of use, but in general you will need to clean your body thoroughly before you enter the baths, use a small towel for modesty as you navigate the complex and are best to avoid talking too loudly. 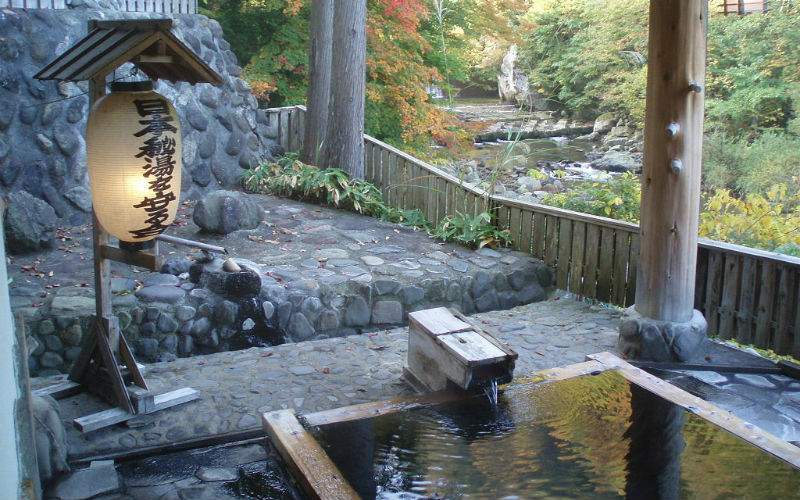 A great place to simply sit, relax and unwind after a day of sightseeing, a visit to an onsen is an authentically Japanese experience that you’ll never forget and certainly won’t regret. The capital of Japan, Tokyo is a vibrant city that draws together the best of traditional and ultra-modern Japan to deliver an experience quite unlike any other. If you have a few free days up your sleeve, take some time out to see some of the incredible sights of Tokyo and discover what it is that makes the city so special. 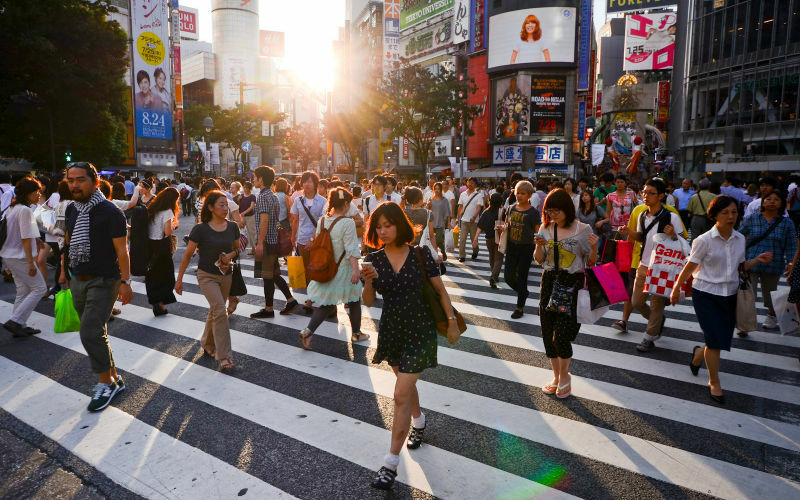 Be sure to check out the iconic Shibuya Crossing, enjoy a spot of people watching in trendy Harajuku and spend some time browsing through the shops and stalls of Akihabara, the city’s electronics, anime and manga district. Shibuya Crossing, Tokyo, Japan. Image Credit: Candida.Performa / CC by 2.0. Attracting visitors from across the globe, Japan’s ski resorts have earnt an impressive reputation amongst snow sports enthusiasts for their well-maintained runs, incredible scenery and regular snowfall. Primarily scattered across the islands of Honshū and Hokkaidō, the country’s best ski resorts and areas offer great conditions for both skiing and snowboarding, as well as a variety runs to suit most skill levels. 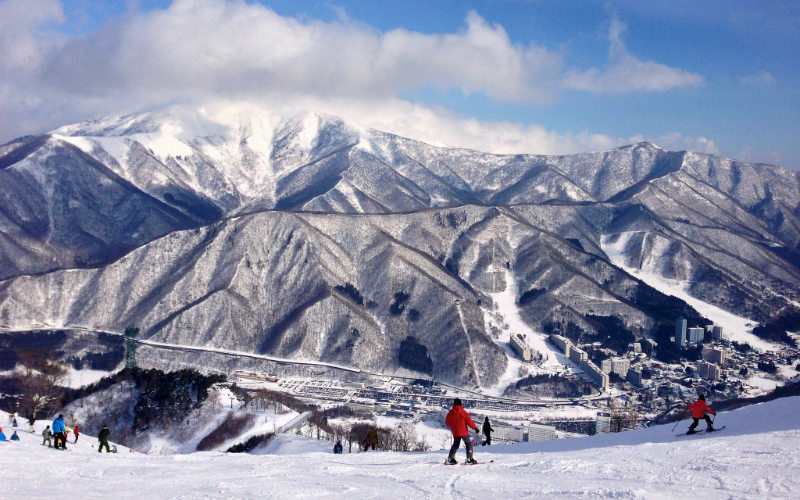 Although there are more than 500 ski resorts to choose from across the country, some of the most popular include Furano, Hakuba, Niseko, Yuzawa and Rusutsu. Yuzawa, Japan. Image Credit: Tetsuji Sakakibara / CC by SA 2.0. Ready to experience some of the most incredible things to do in Japan? Find the perfect Japan tour with Webjet Exclusives today!